"If the education of the citizen is to be our aim at all, it must be our aim from the beginning, and if we are going to do our deliberate work through lessons, it must begin with the lessons. To insure the acceptance of the ideas we offer, we must take care that they are served attractively, and not only to be found, if ever found, after a long and painful search. For this reason it might be better not to begin by taking modern history with the young child. We are a little too close to it. Looking at a picture from a near point of view, we see so clearly all the details that we find it difficult to see the broad lines and the meaning of the whole. If we go further off, however, the details cease to distract our attention, and we see clearly the whole plan. So it is with history. The nearer the history comes to our own time, the fuller it becomes of political and constitutional details, and the more we are involved in questions of statecraft. If, however, we go back to the early history, we find it moves on broader, simpler lines, and the statesmanship, so far as it exists at all, only shows how a resourceful mind attempts to cope with circumstances. "The early histories also are practically biographies, written about great men by men of their own time. With the child, a biography is of greater use than a number of detached history stories, because in the latter it is difficult to make the characters real living men and women, whereas if he drops leisurely into some biography, he begins to think the thoughts and take the point of view of the man whose life he is studying, and he becomes accustomed to the dress and habits of his time. In this way, he is living not only in the life of one man, but in his period." I'd like to suggest some some specific Parents' Review articles as wonderfully helpful tools for broadening our understanding of narration. I've given links directly to four articles below. But you can also search through all the PR articles to see what they say about narration. "But is narration, even at this age, always merely "telling back'? It must be, we know, the child's answer to "What comes next?' It can be acted, with good speaking parts and plenty of criticism from actors and onlookers; nothing may be added or left out. 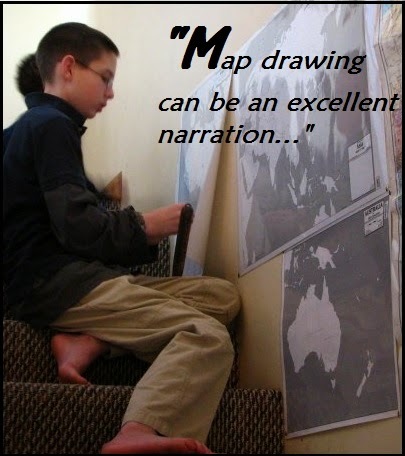 Map drawing can be an excellent narration, or, maybe, clay modelling will supply the means to answer that question, or paper and poster paints, or chalks, even a paper model with scissors and paste pot. Always, however, there should be talk as well, the answer expressed in words; that is, the picture painted, the clay model, etc., will be described and fully described, because, with few exceptions, only words are really satisfying. When children reach the middle school other types of narration may be used; they can offer headings to cover the lesson and then narrate by filling in the details under each heading or the class may be divided into small groups with a leader in each one and narrate part of or all the lesson. The responsible teacher should be keenly aware of everything that is going on. Shy children will often narrate in a group or a specially "mute' child may be given his chance alone with the mistress or a friendly class-mate. There are children and grown- ups too who do not willingly talk; often they will narrate well on paper. "At about this stage a lesson should often end with some serious discussion arising from questions asked by the children or by the teacher. One has to be careful not to allow opinions to be formed on too little knowledge; it is an opportunity to show children how dangerous such carelessly formed opinions can be. This teaching develops as the children move up through the school.
" ....By the time children reach the top of the school narration has become an ingrained habit, has led to observation and thought, to an ability to relate what was learnt last term, last week, yesterday, with "this' that we are now considering. Such co- ordination grows from remembered past narrations over a wide field. Some note in to-day's reading awakes an echo in some other subject or lesson and so the power to compare and contrast and illustrate by example is developed. This should lead to a valuable use of analogy, and application of past history to modern times and modern problems." " -But this is only one way to use books: others are to enumerate the statements in a given paragraph or chapter; to analyze a chapter, to divide it into paragraphs under proper headings, to tabulate and classify series; to trace cause to consequence and consequence to cause; to discern character and perceive how character and circumstance interact; to get lessons of life and conduct, or the living knowledge which makes for science, out of books; all this is possible for school boys and girls, and until they have begun to use books for themselves in such ways, they can hardly be said to have begun their education." And, of course, Ambleside's own webpage has a goodly array of narration ideas, suggestions, and information. The above gives an overview of many different types of narration, through many different ages. It is well to have some idea of where you're headed, so you can make any course adjustments you need to along the way. 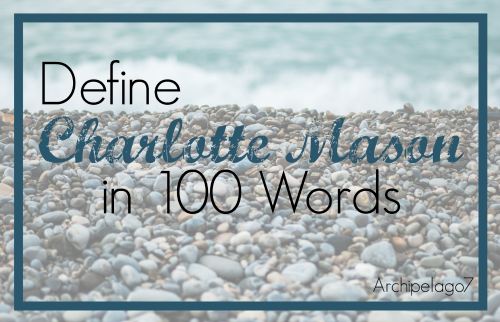 From the beginning, narration is an essential part of a Charlotte Mason curriculum. It is not enough to read the excellent books- the children need the mind work necessary that goes into narrations. They need to think about what they have read, to go over it in their minds and think about what it is they are going to say about it. In Charlotte Mason's classroom, every reading was narrated, but every child did not narrate every reading. However, every child listened to the reading with focused attention because each child knew that he could be called upon to narrate at any time. Another point should be borne in mind; the intellect requires a moral impulse, and we all stir our minds into action the better if there is an implied 'must' in the background; for children in class the 'must' acts through the certainty that they will be required to narrate or write from what they have read with no opportunity of 'looking 'up,' or other devices of the idle. Beads: I came up with this idea by accident some sixteen years ago. I had two children in year 3 or 4, two teenagers, as well as a profoundly disabled child, a very busy toddler, and a baby. One morning as I swept through the living room trying to put it in the kind of order that is about two steps up from being delared a national disaster, I scooped up a couple of beads off the floor so Baby wouldn't swallow them, and popped them in my pocket. Up to that point, my usual method with narrations was to pick a number between one and ten, and have my two grade school students pick a number to see who would narrate. It worked, except it was taking longer and longer as they spent too much time trying to figure out the magic number, and sometimes the children demanded more transparency in the process. This particular day, I absentmindedly put my hand in my pocket, found the beads, and a lightbulb flickered. "R," I said, "You are the red bead. K, You're the blue. After the reading I'll put my hand in my pocket and whichever bead I pull out, that's the child who narrates." So that's what we did. It saved little bits of time that added up over the day. It prevented arguments from suspicious children who always doubted that they really had chosen the number closest to mine four times in a row- we could all see the bead was what it was. But here's an important part of this method- I did not draw the bead before the reading. I didn't even pull it from my pocket immediately after the reading. I waited for perhaps just half a minute- in this way, I found that each of my girls was sharpening her wits, readying her narration- which is the most important part of the exercise. Although only one of them actually narrated, both of them had done the preparatory mind work for a narration. Obviously, it needn't be a bead. It could be legos, cuisenaire rods or other math manipulatives, pennies with different dates, different bottle-caps, any items that feel exactly the same but are visually different. Draw a picture from your reading. Set up a scene from the story with your blocks or other toys. Model something from the story using Play-dough. Narrate into the tape recorder. Write down five sentences about what you read. Think about another story or event that reminds you of what you just read about. Tell Mama about it. Write down three sentences about what you read. Set the timer. You have 10 minutes to plan a short skit from what you read. If you were giving a test on this reading, what are three questions you would ask? Call Grandma and tell her what we read about. Call Daddy and tell him what we read about. Draw a picture of one of the people from the reading today. I did not have the same number of each--there was only one 'skip this narration' and only two play dough and skit suggestions. Children in lB require a quantity of matter to be read to them, graduated, not according to their powers which are always present, but they require a little time to employ their power of fixed attention and that other power which they possess of fluent narration. So probably young children should be allowed to narrate paragraph by paragraph, while children of seven or eight will 'tell' chapter by chapter. 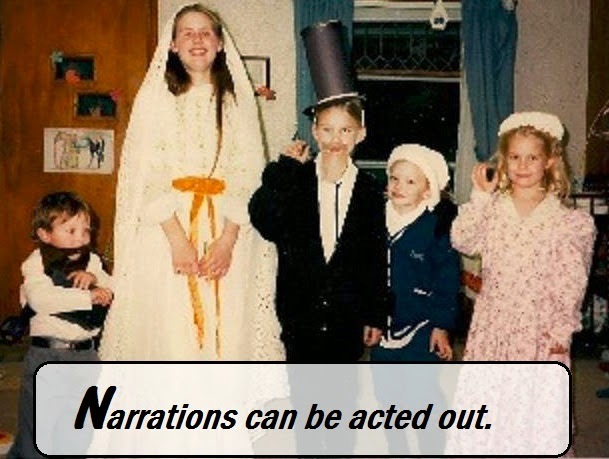 Corrections must not be made during the act of narration, nor must any interruption be allowed. If you have older children, you may also find the narration cube helpful at other times when you want to shake things up a bit and ask for more than just, "Tell me what we read about," although that is also an excellent narration question. A reading without this mindwork is a wasted reading- which is why even if the children don't end up delivering a narration, they must know that they have every chance of being called up to deliver one. You might even, from time to time, pause at the end of the reading, count to ten under your breath, and then point to one of the children to choose who narrates, or say, "No narration this time" if that is what you need to do. Those few seconds give the children time for what matters most- to go over the reading in their own minds. With narration done as Miss Mason represented it, the mind puts a series of questions to itself, and then answers them. And that is how children learn. 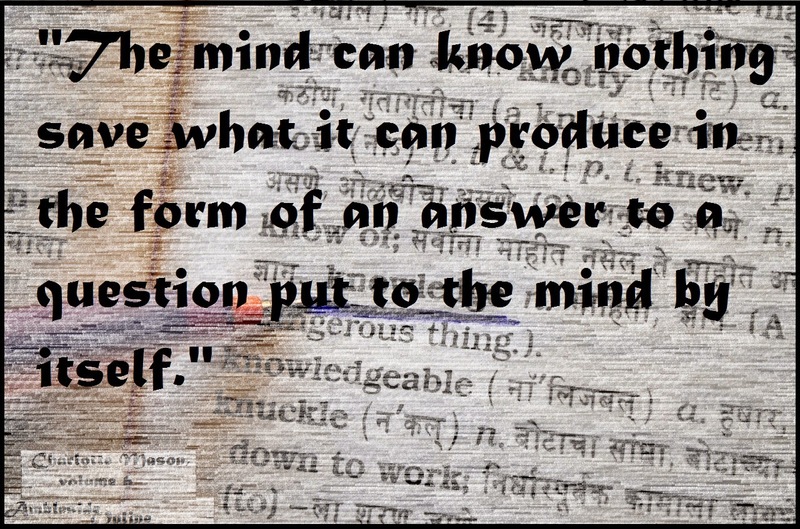 Whatever a child or grown-up person can tell, that we may be sure he knows, and what he cannot tell, he does not know. A Charlotte Mason education is distinct at its very core because it respects that the child is an individual made in the image of God, and he has a right to know and experience a variety of things, not for the purpose of making him suitable for some future employment, but simply because he is a Person, and is therefore entitled to a full life that includes knowing about everything that is good that the world has to offer that might help him to reach the potential that God designed him for. 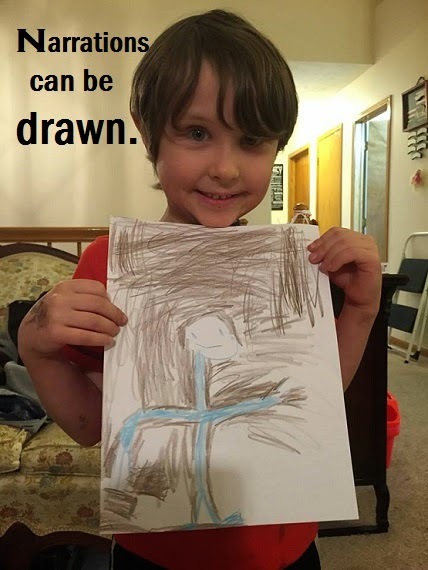 This kind of education attempts to expose the child to a rich variety of knowledge in order for him to make meaningful connections with the world around him and develop authentic relationships with God, and with people both in his own direct environment, and from different times and places. Because the child is entitled to learn about whatever the universe has to offer, his curriculum is carefully arranged for him with a goal of offering variety, much like a delicious, bountiful feast. Science, literature, the arts and practical skills are some of the mandatory dishes offered at this mental banquet. The teacher's role is to provide this well-planned feast, but the responsibility for partaking and digesting this food for the mind rests on the child. The teacher acts as a guide and fellow-partaker of the feast rather than as the authority dispensing knowledge, trying to lecture facts into the child's mind. Training the child to maintain focused attention allows lessons to be kept short enough to keep his mind fresh and alert and still leave much of the day free to pursue his personal interests. Ideas that encourage wonder and reflection from the greatest minds of all time are transferred through interesting, narrative books that spark life in the mind, instead of dry, dull textbooks. These books are so vital to this kind of education that the term "living books" is sometimes used synonymously with Charlotte Mason. Rather than answering stock comprehension questions or outlining wearisome lists of facts, the child considers and clarifies for himself what he read and tells it back in his own words in order to make that knowledge his own. This is called narration, and, as a major part of the child's work in his own learning, is key to making this kind of education successful. Language arts is learned, not through isolated workbooks and practice sheets, but integrated with his reading through role modeling by studying and copying well-written passages from the school books being used in other subjects. Science begins with an emphasis on first-hand experience with the wonders of God's world. This direct observation and sensory participation in nature continues even after more focused science is added to the curriculum. There is an emphasis on moral training, which includes putting oneself in someone else's shoes, and doing one's duty even when that's not the easiest or most convenient choice. Much of this is done through vicariously experiencing the consequences of right and wrong choices through classic books with substantial characters of depth rather than shallow, sentimental stories. Students educated this way tend to be well prepared to pursue whatever path they choose, whether that be college, job, military or family. The AmblesideOnline homeschool community has many alumni who have graduated and gone on to successful adulthood. What makes a Charlotte Mason education distinct is that these students continue to pursue learning because their schooling has taught them that learning isn't a thing that ends with high school graduation, but something that adds vitality and meaning to their existence. How Do You Define CM in 100 Words? A few months ago, while I was waiting for my daughter's piano lesson, I thought it would be fun to challenge myself to get a definitional synopsis of CM squeezed into 100 words. "In a Charlotte Mason education, the child's dignity as an individual made in God's image is respected. His education connects him to the world around him, building relationships with God and people from various places and times. Outdoor life is emphasized. Focused attention at short lessons keep the mind fresh and leave free time for personal interests. Living books put the child in touch with vital ideas, and narration teaches him to process those ideas. Copywork and dictation are the bulk of language arts instruction. The educational course of study is teacher-directed, but learning is the responsibility of the student." It's admittedly a bit choppy. One of the other AO AA (Ambleside Advisory/Auxiliary members) made an improvement that was not only smoother, but weighed in at only 97 words -- less than 100. Maybe I can convince her to share hers in the comments! "The child's dignity as an individual made in God's image is respected. Education means connection between the child and the world around him. Outdoor life is emphasized. Focused attention at short lessons provide free time for personal pursuits. Living books and narration allow the child to process ideas. Copywork teaches handwriting. Course of study is teacher-directed, but learning is the student's job." "The child's personhood is respected. His education connects him to the world and ideas. The method includes outdoor life, focused attention, short lessons, living books, narration, copywork." I think this is a good exercise for anyone. What better way is there to prepare to answer questions about your homeschool method than by getting to its bare bones and then re-assembling those bones in your own words? 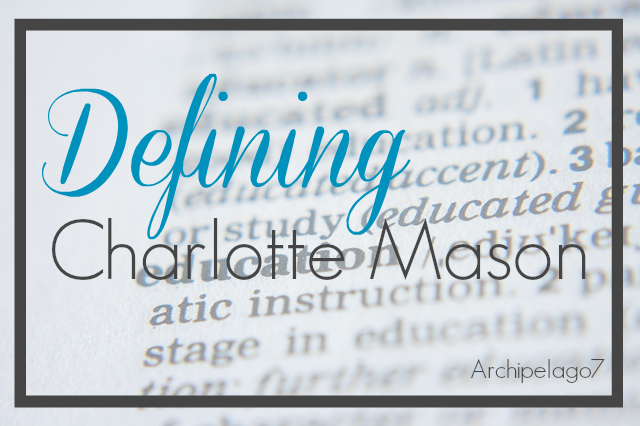 How would YOU define a Charlotte Mason education? If you take up the challenge, I would love to see what you come up with! The CM blog carnival for March is up- be sure to check it out!